We work with school districts, community-based organizations, and statewide leaders to institute practices and policies that foster social-emotional learning opportunities for children and youth through their school day, after school, and summer programming. Social-emotional learning (SEL) is foundational to expanded learning programs, and is essential for children’s success in school and beyond. School districts are increasingly recognizing that SEL promotes student achievement, student engagement, and a positive school climate and culture. We ensure that the school day and expanded learning programs are effective and authentic partners around their shared goals for SEL and children’s overall success. Our goal: For all children to have equitable access to a consistently positive learning environment from 8:00 a.m. to 6:00 p.m. year-round. As defined by the Collaborative for Academic, Social, and Emotional Learning (CASEL), SEL is a process through which children and adults acquire and effectively apply the knowledge, attitudes, and skills necessary to understand and manage emotions, set and achieve positive goals, feel and show empathy for others, establish and maintain positive relationships, and make responsible decisions. With our partners, PCY has defined specific outcomes that expanded learning programs’ high quality youth development practices are best able to support. Since 2014, PCY has convened school districts from across California in a professional learning community to plan and implement strategies to improve and better coordinate SEL practices. These districts are on the vanguard of bridging SEL delivery across the school day and expanded learning through breaking down silos, training school and expanded learning staff, and gathering momentum in their communities for better, more consistent SEL practices. Through our work with these districts, we are identifying promising practices that can be sustained, shared, and scaled elsewhere. Based on our experience working directly with districts and their community partners, PCY advises statewide decision-makers about the systems and policies that best support students’ SEL development. We convene stakeholders from across the state – including representatives from the school day, expanded learning, technical assistance, advocacy, and research institutions – to gather input and develop recommendations for the California Department of Education. These recommendations and positions are amplified through policy briefs, blogs, and reports developed collaboratively with our partners. PCY also sits on California’s Collaborating States Initiative planning team, a national effort by CASEL to integrate SEL practices and standards with state education policy. This two-page infographic can be used to show expanded learning staff how their programs support SEL outcomes for students, and provide a framework to discuss SEL with their school partners. This paper shows how expanded learning programs contribute to SEL, making the case for better coordination between the school day and expanded learning to ensure that young people thrive in school and as citizens in the 21st century. 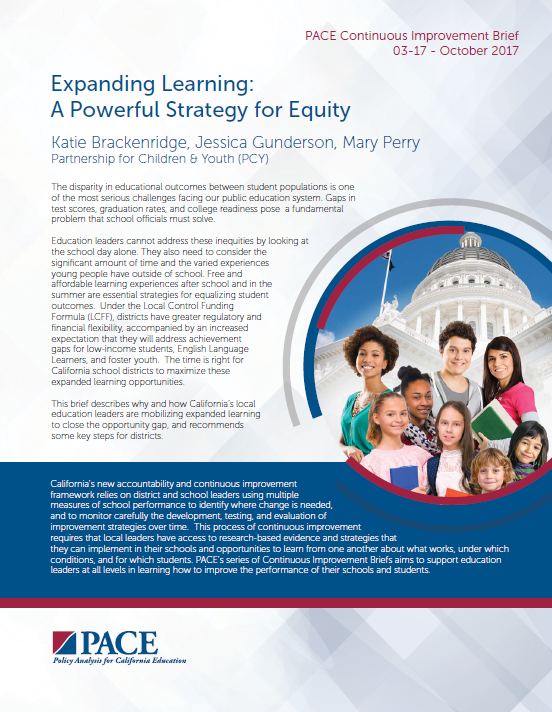 This brief provides language and strategies to support alignment between K-12 and expanded learning programs, by cross-walking key priorities and initiatives in California that impact SEL, and providing San Francisco Unified School District as a case study to illustrate how to operationalize this alignment. This guide is designed to help California school districts and their partner organizations identify tools to assess the quality of their practices in relation to SEL. This brief describes how free and affordable learning experiences after school and in the summer support SEL, develop our education workforce, and are essential strategies for closing the opportunity gap, with specific ideas for districts to take the next step. PCY is a member of Expanded Learning 360°/365, a statewide initiative to help school districts and their expanded learning partners improve and better align their SEL strategies. For more information, visit www.expandedlearning360-365.com.